The Fat Boy is the hardest bike in the Harley lineup. The engine is not rubber mounted, it’s counterbalanced, so it has a rawer feel. The Fat Boy feels a bit more alive than the Road King and the other touring models; the trade off is that there’s less comfort for the rider and especially the pillion (who gets to sit on a tiny pad). The Fat Boy looks mean, feels a bit mean, and as a result you ride it a bit differently than the other Harley models. We notice that clients who choose the Fat Boy tend to blip the throttle more at stoplights! And a lot of them seem to own R1’s and GSXR’s back home. That’s not to say the Fat Boy is anything like a sportbike. 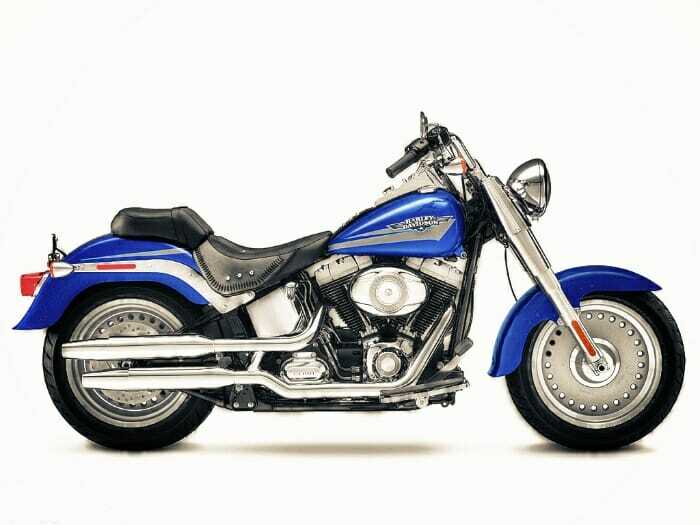 Like most Harleys, the Fat Boy runs out of ground clearance fast, and the steering geometry is very relaxed compared to even the tamest of sportbikes. There’s no wind protection, something you should think about when choosing a helmet (we recommend bringing along a full-face lid). Short, piss-pot style helmets may look cool, but when the wind gets under them, they tend to pull up and back. On a Fat Boy the wind is right in your face so this can be a problem, not to mention a bug hitting you on the nose at 60 mph! We like the Fat Boy for shorter rides. It’s certainly the bike we’d choose for hooning about Hollywood. If you’re bringiing a pillion along however, we’d recommend something else, like a Road King, Heritage Softail or an Electra Glide. That said, you’ll look much cooler blipping the throttle on a Fat Boy!